To Cite: Yazdanpanah S, Geramizadeh B, Nikeghbalian S, Malek-Hosseini S A. Hepatocellular Carcinoma and Its Precursors in 103 HBV-Related Cirrhotic Explanted Livers: A Study from South Iran, Hepat Mon. 2016 ; 16(8):e38584. doi: 10.5812/hepatmon.38584. Background: The most common cause of liver transplantation in Iran is hepatitis B positive cirrhosis, and it also one of the major and important causes of hepatocellular carcinoma (HCC). Most cases with HCC follow a multistep sequence. 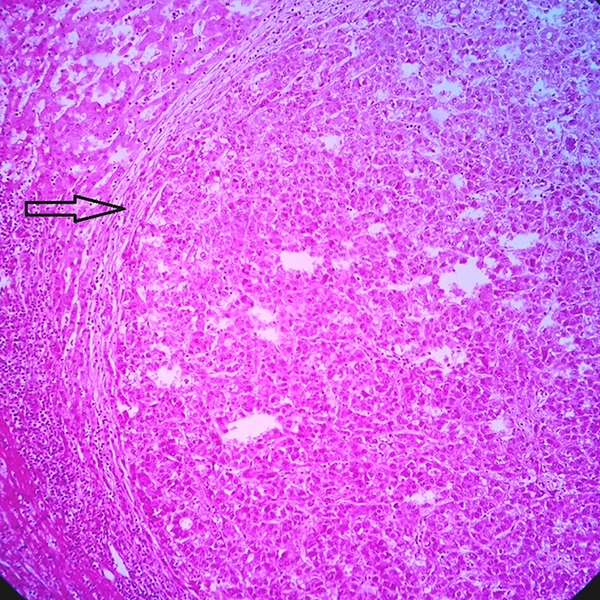 Morphologic lesions during hepatocarcinogenesis include dysplastic lesions and small cancerous lesions (2 cm in diameter; early HCC). However, insufficient information is available on the incidence of HCC and its precursors in hepatitis B-related cirrhosis. Objectives: In this study, we determined the incidence of HCC and its precursors in hepatitis B-related cirrhosis in the largest liver transplant center in Iran. Methods: In a two-year study, all explanted livers of patients with hepatitis B virus (HBV)-positive cirrhosis were completely sectioned and examined. Each specimen was investigated grossly and microscopically to determine any abnormal nodule or cellular changes (at least 15 sections from each liver). Results: Among all explanted cirrhotic livers (103 livers) during the study period (2014 - 2015), 92 (89.3%) had dysplastic foci with large cell changes (LCC), 57 (55.3%) of which showed small cell changes (SCC) as well. Thirty-nine cases (37.9%) had low-grade dysplastic nodules (LGDN), 38 (36.9%) high-grade dysplastic nodules (HGDN), 19 (18.4%) were early hepatocellular carcinoma (eHCC), and 21 (20.4%) were hepatocellular carcinoma more than 2 cm. All the cases with eHCC and HCC of more than 2 cm also had SCC, LCC, HGDN, and LGDN. Thirteen cases of eHCC were accompanied with HCCs more than 2 cm, and 6 cases of eHCC did not show any HCC (larger than 2 cm). Conclusions: SCC, LGDN, and HGDN are common associated findings and precursors of HCC in livers infected with hepatitis B. A strict follow-up and a precise and thorough sampling of livers with SCC and any abnormal dysplastic nodules (DNs), especially those larger than 1 cm, are highly recommended because these DNs are highly associated with malignancy. Hepatitis B virus (HBV) is an important risk factor for developing hepatocellular carcinoma (HCC) (1). HCC is the fifth most common cancer worldwide, and it causes significant public health problems, especially in association with chronic hepatitis B (2). HCC can be developed secondary to liver cirrhosis (3). Most cases with HCC follow through a multistep sequence. 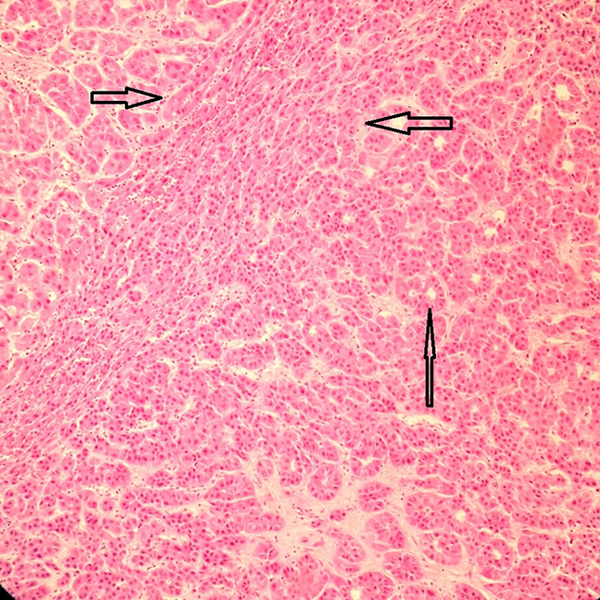 Morphologic lesions during hepatocarcinogenesis include dysplastic lesions (dysplastic foci (DF) and dysplastic nodules (DNs)) with low- and high-grade dysplasia and small cancerous lesions (2 cm in diameter; early HCC) (4-7). The most common cause of cirrhosis in Shiraz transplant center, which is the largest liver transplant center in the country, is HBV related, and majority of patients with HCC in this center are also HBV related (1). Therefore, we attempted to determine the incidence of HCC and its precursors in this group of cirrhotic patients through a thorough examination of explanted HBV-related cirrhotic livers. A two-year cross-sectional study was performed on 103 explanted HBV-related cirrhotic livers from the pathology department of Shiraz University of Medical Sciences. During the study period (2014 - 2015), explanted cirrhotic HBV-related livers (recipient cirrhotic liver after liver transplantation) received in the department of pathology were fixed in formalin for 24 - 48 hours. These livers were precisely inspected for any lesion and sectioned at 0.5 cm intervals. Each section was thoroughly examined for any suspected lesion. Histologic sections from any hepatic nodule larger than 1 cm in diameter or those with any kind of difference with background parenchyma, such as color or consistency, were studied (Figures 1 and 2). Sections were stained with hematoxylin and eosin method, and slides were examined under a double-headed microscope by two pathologists. The lesions were classified into having DF or DNs. DF were classified into having either small cell changes (SCC), formerly called small cell dysplasia, or large cell changes (LCC), formerly called large cell dysplasia. Nodules were studied and classified as low-grade dysplastic nodules (LGDN), high-grade dysplastic nodules (HGDN), and hepatocellular carcinoma (HCC) (5). The following criteria were used to classify the different nodules in cirrhotic livers: cellularity, thickness of hepatocellular plates, nuclear atypia (either pleomorphism or irregular contour), nucleocytoplasmatic ratio, cytoplasmic staining (eosinophilic, basophilic, amphophilic, and clear), pseudoacinar pattern, stromal invasion, portal tracts, biliary pigment, lipid vacuoles, and iron status of nodules (8). In LGDN, hepatocytes are not completely abnormal. That is, they show normal or slightly increased nucleocytoplasmic (N/C) ratio, minimal nuclear atypia, and no mitotic activity, but portal tracts are still present. Compared with LGDN, HGDN have all of their features except the N/C ratio is higher, nuclear atypia is more obvious, cytoplasmic basophilia is more significant, and liver plates (more than two cells thick) are thickened with mitotic figures. In HCC, cell size is usually decreased, nuclear density is at least twice that of normal, nuclear atypia is definite, mitotic figures are present, and pseudoacinar formation may be present (9). The term ‘‘early HCC’’ mean HCC in an early stage that are small in size (usually < 2 cm). 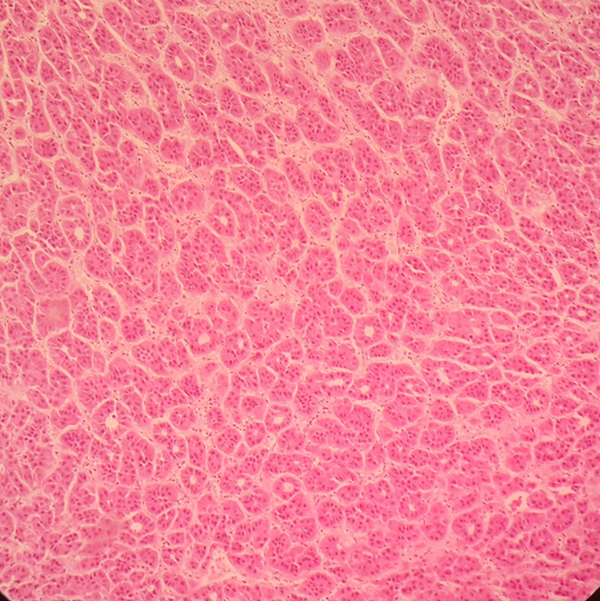 Histologically, HCC are well differentiated and lack prominent cellular and structural atypia (10-13). For convenience, we used the term advanced HCC (aHCC) for HCCs that are greater than 2 cm in size in this article. The statistical analysis was conducted using SPSS version 19. The chi-square test was used to evaluate the significance of the relation between the nodules and their categorical variables. A significance level of 0.05 was considered. A total of 103 patients were included in the study. Among the patients, 14 (13.16%) were women, 89 (86.4%) were men, age ranged from 20 to 73, and mean age was 51.4 ± 10.5. Among all explanted cirrhotic livers, 92 (89.3%) had DF with LCC, 57 (55.3%) of which showed SCC as well. Out of these 103 explanted livers, 39 (37.9%) had LGDN, 38 (36.9%) had HGDN, 19 (18.4%) had early hepatocellular carcinoma (eHCC), and 21 (20.4%) had aHCC (Figures 3 - 6). Note that all the cases with eHCC and aHCC also had SCC, LCC, HGDN, and LGDN. Thirteen cases of eHCC were accompanied with aHCC, and 6 cases of eHCC did not show any aHCC (size larger than 2 cm). All of the 21 aHCC cases were transplanted with the preoperative diagnosis of malignancy and hepatitis B-related cirrhosis. However, among livers with eHCC, 6 were not accompanied with aHCC, 2 of which were unsuspected before surgery and diagnosed on the explanted liver. The two aHCC cases were smaller than 2 cm in diameter (Table 1). Our results showed that the presence of SCC, LGDN, and HGDN has a statistically significant association with eHCC (P < 0.05) and HCC (P < 0.05). Moreover, the presence of eHCC is associated with aHCC (P < 0.05). HCC is a poor prognostic cancer, and it is one of the most common causes of cancer death around the globe. HCC is also common in countries with high incidence of HBV-related cirrhosis (1). Despite the improvements in treatment modalities for HCC, the survival rate remains low even after liver transplantation because HCC cannot be easily diagnosed before the advanced stage (14). Therefore, studies on the incidence and diagnosis of precancerous lesions of HCC are important, especially for patients who develop HCC secondary to HBV infection and cirrhosis. Therefore, pathologists and clinicians should be able to diagnose aHCCs and eHCCs from their precursor lesions using various techniques preoperatively (10). Hepatic precancerous lesions are currently divided into two categories depending on cytological and histological changes: microscopic DF and macroscopic DNs (11). DF can be recognized only in microscopic examination as they are smaller than 1 mm. They are either DF with SCC or DF with LCC. DNs are recognizable both in gross examination of hepatic specimens and in microscopic examination as well-defined nodule lesions that are different from the background cirrhotic liver tissue in size, color, texture, or degree of bulging on the cut surface. DNs can be HGDN or LGDN. HCCs can be either eHCC (less than 2 cm) or aHCC (larger than 2 cm) (8, 9). Globally, infection with HBV is a major risk factor for developing HCC. HBV is the most common cause of cirrhosis and HCC in Iran (12). In this study, we attempted to identify the true prevalence of HCC and its precursors in 103 explanted livers through thorough sectioning of at least 15 sections for each liver after precise inspection of the gross specimens. 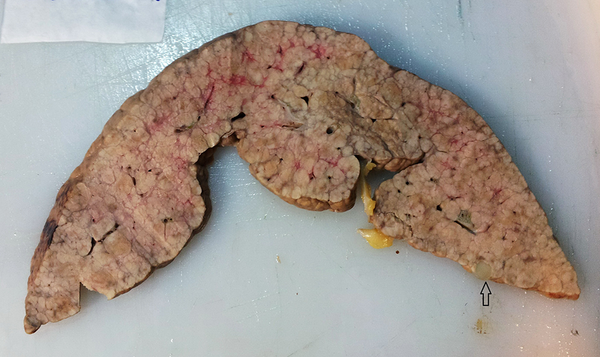 Among all 103 explanted cirrhotic livers in our study, 92 (89.3%) had DF with LCC. According to this result, LCC is a common finding in cirrhotic livers of patients with chronic hepatitis B, but it does not seem to be associated with any malignant lesion, thus confirming the lack of premalignant potential in theses lesions. This issue was controversial in previous literature. That is, some studies similar to our own found that LCC (formerly called LCD) had no histogenetic association with HCC (13). Others concluded that LCC in relation to HBV might not only be an innocent bystander but might be closely related to hepatocarcinogenesis (15). SCC was initially described by Watanabe et al. 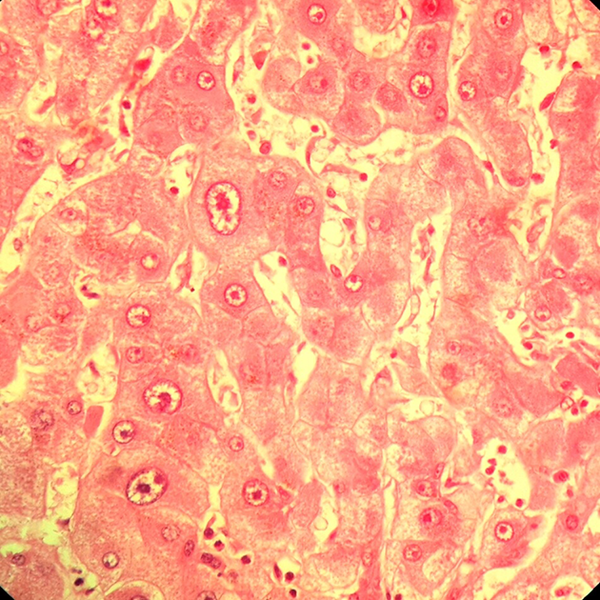 as “liver cell dysplasia of small-cell type” in 1983 (16). It can be diagnosed by the presence of clusters of hepatocytes with a small size, minimal nuclear atypia, high N/C ratio, and high nuclear crowding. It is generally considered an early precancerous lesion. The report by Plentz et al. indicated that severely decreased expression of p16 and p21, telomere shortening, and accumulation of DNA damage in SCC and HCC compared with LCC and cirrhotic nodules were all suggestive of the malignant potential of SCC compared with LCC (17). In our study of 103 patients with hepatitis B-associated liver cirrhosis, 57 (55.3%) had SCC. Out of these 57 livers with SCC, 19 (70.4%) had eHCC and 21 (36.8%) had HCC. Our results showed that the presence of SCC is associated with eHCC (P < 0.05) and HCC (P < 0.05).Therefore, SCC may be associated with the presence of eHCC or HCC. According to our results, a thorough sampling is advised for every patient with SCC to detect any malignant lesion. This result was also obtained in most previous studies. For example, in one study, SCC was proved to be associated with aneuploidy and elevated DNA index, and it was found to be a moderate-to-high risk for progression to HCC (18). Among the 103 explanted livers, 39 (37.9%) had LGN, 38 (36.9%) had HGDN, 19 (18.4%) had eHCC, and 21 (20.4%) had aHCC. Thus, 70% and 53% of the cases with LGDN and 50% and 55% of the cases with HGDN showed eHCC and HCC, respectively. This association was statistically significant (P value < 0.05). According to previous studies, LGDN and HGDN are indicators of increased risk of HCC in cirrhotic livers. However, HCC can also develop in the absence of DN. Moreover, HCC nodules are commonly seen within DNs (i.e., nodule-within-nodule pattern) (14). In conclusion, SCC, LGDN, and HGDN seem to be common associated findings and precursors of HCC in livers infected with hepatitis B. A strict follow-up and a precise and thorough sampling and sectioning of livers with SCC and any abnormal DNs, especially those larger than 1 cm, are highly recommended because of their association with malignancy. Authors’ Contribution: Shahrzad Yazdanpanah: gross and microscopic study of the cases; Bita Geramizadeh: idea of the project, gross and microscopic study of the cases, writing of the paper; Saman Nikeghbalian: Surgery of the cases; Seyed Ali Malek-Hosseini: Surgery of the cases.